I finished the bookmark for my sister for Christmas. It is a pattern by Diane Stevens. It wasn't difficult but did take a bit of time. 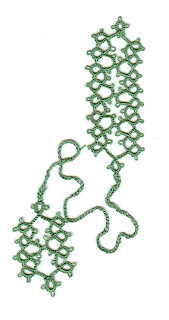 I have found another bookmark pattern I hope to try as soon as my new thread arrives this week. I am doing the rosette again. Georgia gave me a critique and I see I need to do some work on making improvements. I hope I have everything figured out and will be sending the new one on to Georgia tomorrow for another critique. Then I can maybe practice some of the techniques we discussed in last night class.